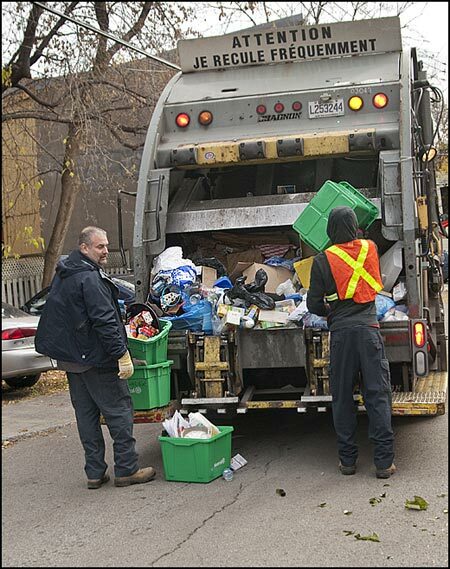 From the Plateau-Mont-Royal web­site explain­ing the use of “garbage trucks” to pick up recyclables. Thanks kkjensen! — How does it get sorted if it all goes into the same truck and crushed big time? Keep in mind that glass bot­tles also go into that truck and get smashed up with every­thing else. I’m also in Que­bec (Chateau­guay though) and it’s con­tracted out here…maybe they’re just using a garbage truck but it’ll still get recy­cled? Extract­ing paper from crushed cans would be tough though. Recy­cled mate­r­ial is worth quite a bit so I can’t imag­ine them throw­ing it out if it’s already sorted. A truck full of col­lected paper got stolen in Cal­gary while I was in school there…why?? ?…the con­tents were untrace­able and worth over $20K.